But construction of the world's largest telescope will take $1.4 billion (1.084 billion Euros), a decade of work and an iron will on the part of the countries participating. "We remain confident that the European member states will give the green light," Lars Lindberg Christensen, an ESO spokesperson, told SPACE.com during an interview from the organization's headquarters in Germany. "In a situation where you have a slowdown of the economy, you need to invest in research and development. You need to invest in industry." Over the past 50 years, ESO telescopes have made stunning discoveries, including aiding the Nobel-prize winning find showing that the universe is accelerating as it expands. When ESO was formed in 1962, there were few southern hemisphere telescopes available to do astronomy. The telescopes available in Chile, South Africa and Australia were typically no more than 6.5 feet (two meters) in diameter. This made it difficult to look at the Milky Way's center, or observe the Magellanic Clouds nearby Earth, or watch comets that graced southern hemisphere skies. But the money is worth it, ESO determined, because the site has 330 cloud-free days a year. A typical astronomer travels roughly 6,200 to 7,500 miles (10,000 to 12,000 kilometers) to work there, so the weather patterns offer them a very high probability of getting usable telescope time. "Basically, weather was the main driving force for the location," Christensen said. "The more cloud-free conditions and the more stable atmosphere [one has], the more astronomy you can do." With ESO in the country, Chilean astronomers have immeasurably increased their activities in the field. They are granted a percentage of ESO telescope time in recognition of their agreement to host ESO, and officials noted they are contributing great science in their own right. Earlier this year, for example, Chileans led an ESO effort to catalog 84 million stars in the central part of the Milky Way. Relations weren't always this smooth. In 1995, Chile briefly ordered a work stoppage on the Very Large Telescope's construction amid loud protests from ESO. At the time, Chile was facing lawsuits from private citizens who disputed the government's claim to land that ESO was using for the construction. 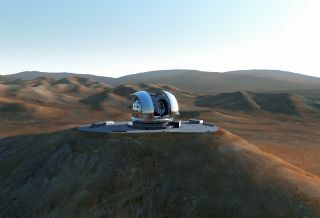 The dispute was swiftly resolved, the VLT completed construction, and relations today are "close and collaborative" between ESO and Chile, the organization said. ESO's facilities include 15 operational telescopes that it owns or shares, scattered across three mountaintop sites in the Atacama Desert of Chile. La Silla is the site where ESO's first telescope saw light in 1966, and where the New Technology Telescope first tested "active" optics to correct for external distortions such as temperature that affect telescopic mirrors. More recently, the site added an exoplanet seeker dubbed HARPS, for High Accuracy Radial Velocity Planet Searcher. Paranal is ESO's most famous location. The observatory hosts the Very Large Telescope, which is a collection of four 27-foot (8.2-meter) telescopes that can all link together to observe one object. The VLT can even hook up with four movable auxiliary telescopes – each about six feet (1.8 meters) in size – for a baseline of up to 656 feet (200 meters). The last site, Llano de Chajnantor, is the location of the world's most complex radio telescope: the Atacama Large Millimeter/submillimeter Array (ALMA), which just started science observing in 2011. As the site has grown, so has the maturity of the organization. ESO began with five founding countries and has now expanded to 14. Brazil is awaiting ratification to be the 15th member country. ESO fields 1800 proposals for telescope time a year, generally receiving requests for 3 to 6 times more than the number of observing nights available. (The most oversubscribed telescopes are VLT and HARPS.) Work from ESO telescopes generates roughly 800 refereed papers a year. While the science goes on in Chile, ESO is improving its headquarters in Germany. The E-ELT prompted a badly needed expansion of ESO's facilities that will essentially double the amount of space available to employees. The "green-friendly" construction will include a new office and a technical building, as well as a bridge that will span the two locations. The more than 200,000-square-foot expansion is on time and budget, and should finish in 2013. "Storage in the current building is short of space, so [more storage] is one little silly thing that people are looking forward to," joked Christenson. More importantly, the new headquarters is being put in place to better support the E-ELT. Officials are expecting a bevy of discoveries from the telescope. The E-ELT will measure the properties of the first stars and galaxies, and — astronomers hope — will shed some light on the mysterious dark matter and dark energy that makes up most of the universe. Most exciting to ESO is the potential to see how the universe operated in its early years. "It is actually possible with this bigger telescope to go back in time and measure changes to the [universe's] fundamental physical constants," Christenson said. "It might be that the physical constants remain the same, but it could also be that they change. If they change, that would give us a view into some completely new physics that we don't know about."